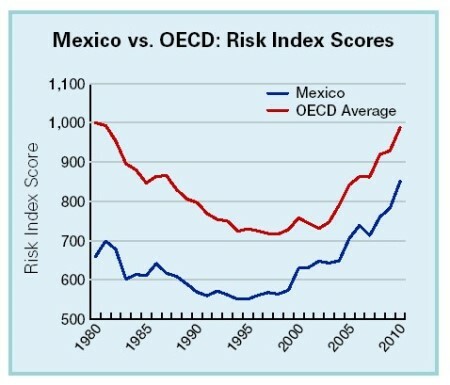 According to a recently published U.S. Chamber of Commerce study of the largest energy-consuming nations, Mexico is the most energy secure country of the 25 countries in the large energy user group with a score 14% below the OECD average (see graph). The study compiled an “International Index of Energy Security Risk”, taking into account 28 metrics including fossil-fuel imports, power generation and carbon-dioxide emissions, using data from sources such as the U.S. Energy Information Administration and the Paris-based International Energy Administration. Other countries with high levels of energy security included the U.K., Norway, New Zealand, Denmark, Australia and the U.S. (Which tanked 7th overall. Energy security was lowest in the Ukraine, followed by Thailand, South Korea, the Netherlands, Brazil, Italy, Turkey and Japan. low costs to produce electricity. As the graph shows, however, Mexico’s energy security is edging closer to that of OECD countries, meaning that Mexico’s comparative advantage in energy security is slowly shrinking. Mexico is the world’s seventh largest oil producer, and also a major oil exporter. While production levels had been declining, they have begun to rise again in recent months. Mexico also has large reserves of natural gas, but these have not been developed quickly enough to prevent imports of natural gas from rising sharply in recent years as demand for natural gas outstrips domestic supply.